LINCOLN, Neb. (AP) Nebraska took care of business Saturday, building double digit leads in each half on the way to defeating Rutgers and keeping its postseason drive alive. Nebraska last made the NCAA Tournament in 2014, and has its sights set on a return to the tournament. But a low RPI and a lack of wins over ranked opponents has the Huskers needing to win every game. Nebraska (19-8, 10-4) won its seventh Big Ten conference game in its last eight tries. Rutgers (12-15, 2-11) has now lost seven consecutive conference games. Nebraska, which built a 16-point first half lead only to see Rutgers cut the margin to five early in the second, used a 10-0 run capped by a pair of Isaac Copeland jumpers to take a 48-32 lead with 14:35 remaining. Then, as they had in the first half, the Scarlet Knights surged back with three straight baskets, cutting the Nebraska lead to 10 on Corey Sanders’ basket with 12:15 remaining. The Huskers responded with a 15-6 run to take a 63-44 lead on Isaiah Roby’s coast-to-coast layup with 6:31 left. Rutgers scored the game’s final six points against the Huskers reserves to cut the final margin to 12. Nebraska was led by Isaiah Roby, who had 10 points, 11 rebounds, two blocked shots and a spectacular dunk that saw him take off from the Big Ten logo in the middle of the lane and slam the ball through the hoop. Roby had 19 points and eight rebounds in Nebraska’s 91-85 win at Minnesota Tuesday. Nebraska’s swarming man-to-man defense held Rutgers to just 35 percent shooting for the game. Nebraska hit 45 percent of its shots and outscored Rutgers by nine from the free-throw line. Rutgers: The Scarlet Knights were unable to find their shooting touch, making just 14 percent from 3-point range. Nebraska: The Huskers’ 19 wins match the program’s highest win total in 10 years. Nebraska won 19 games in 2010-2011 and 2013-2014. The Huskers have at least five games remaining in the season. Nebraska also won for the 13th time at home this season. It’s only home loss came against No. 10 Kansas in December. Nebraska wore black warm-up T-shirts emblazoned with ”Hate Will Never Win,” the team’s message it is delivering to University of Nebraska-Lincoln community following the release of videos of a white nationalist student that have roiled campus. The Huskers also appeared in a video shown before the game that concluded with the statement that Nebraska is ”a community that stands together like a team. 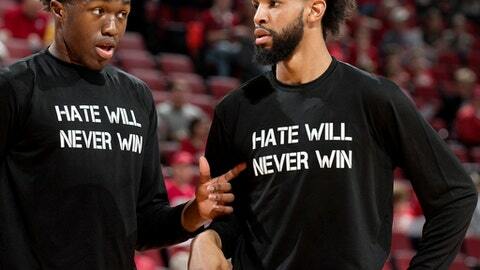 We rise together against racism and hate because hate will never win.” The Huskers will wear the T-shirts in warm-ups for the rest of the season, Miles said. Rutgers returns home for its next contest, hosting Northwestern on Tuesday. Nebraska stays at home to host Maryland on Tuesday.